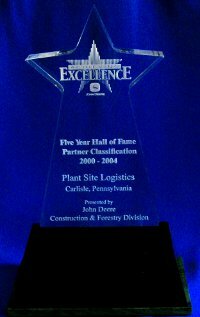 Over the years, Plant Site Logistics, Inc. has strived to be the best Logistics provider in the country. We take pride in working with our customers to provide the best service possible. One result of that continued dedication to customer satisfaction is 18 consecutive years of earning an Achieving Excellence Partner award from 2000 to 2016 with John Deere's Divisions. Plant Site Logistics, Inc. provides the same level of dedication to customer satisfaction to all our customers no matter if they move one load a month or ten thousand loads a month.